My Monday was full of accomplishments, namely the cleaning out of son2's bedchambers! I am happy to report there were no tears, pits in my stomach or sadness and malaise. Speaking of the above, this is the outfit I wore the day after I dropped him off at school. Hence, the shades to hide the red, swollen, tear filled eyes. If you remember, I wore this little dress for the Katie Homes inspiration picture a couple of weeks ago. Sorry Katie, but I like this look better than yours. I love the way the leopard print belt just gives this dress a whole new vibe. you got yourself an outfit. I might have worn red shoes with this if I had had any in my closet. Sadly, I don't own one single pair of red shoes. I might just have to remedy that. Do you own a pair of red shoes? lovely dress! and that necklace is a very nice touch, I adore it. Can't go far wrong with a bit of leopard print, I reckon! 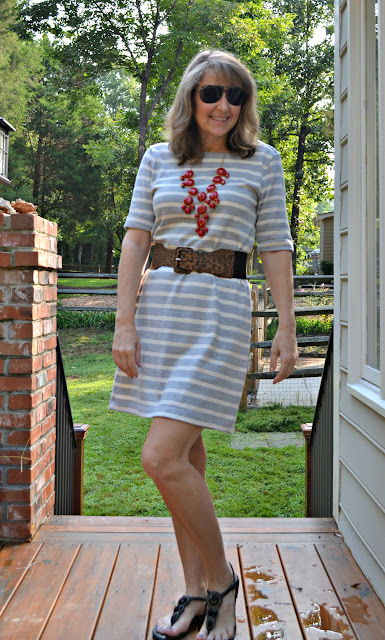 Love the necklace too, takes the dress in another direction from the ubiquitous nautical look. The dress looks so adorable with the bubble necklace! Awww..You are making progress Brett :) By the time they come back for thanksgiving and eat all the food, you'll be ready to send them back to univ. A little leopard is perfect and really changes the look of the outfit. Very NICE! The accessories definitely elevated this dress to a chic-dom. Is there such a word? You'll begin to enjoy your empty nest-dom here pretty soon...I promise! 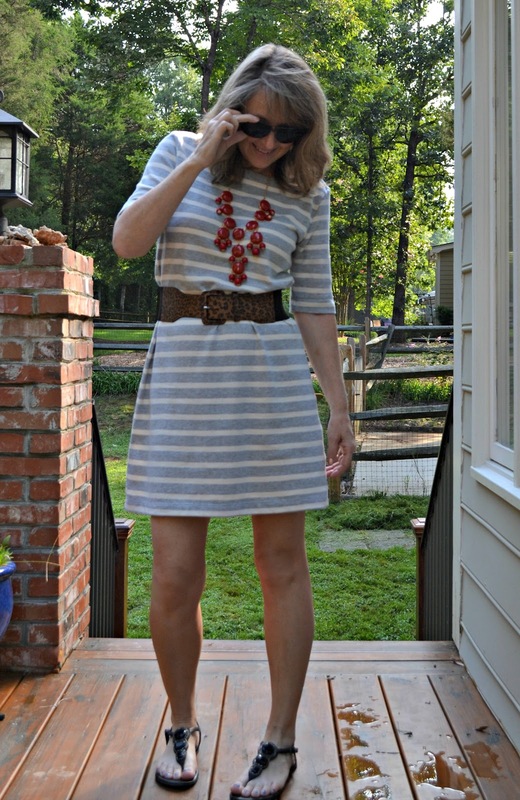 Love this outfit and the post title! I don' have a pair of red shoes...but it's on my list. Brett, this look is fab! I love the belt, and the necklace is a great color! Surprisingly enough (due to the size of my shoe collection) I don't own one pair of red shoes but I would love to, still hunting for the right pair! 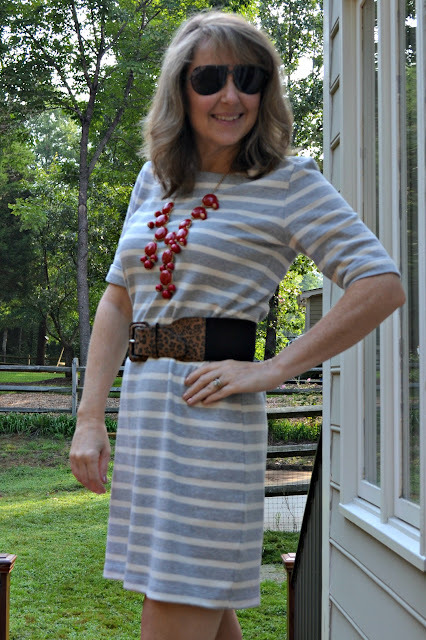 Leopard and stripes is one of my fave combos and then throw in a red statement necklace, wowza now that's an outfit! Such a cute look! Loving your dress and how you added the belt! Totally took it up a notch! This dress is so cute. You look great and those legs!